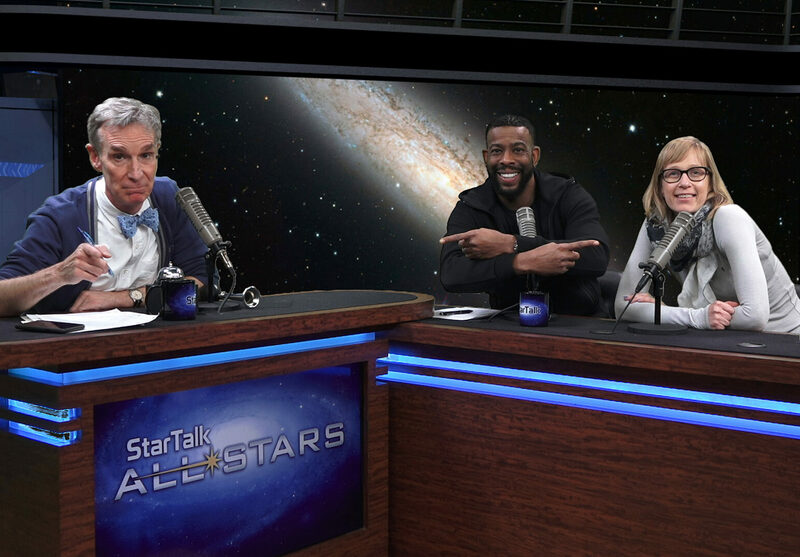 StarTalk All-Stars is back for its Season 3 premiere! And who better to kick off our new season than Bill Nye the Science Guy himself. He’s here talking about one of his favorite subjects: climate change, with help from comic co-host Chuck Nice and climate scientist Kate Marvel. Together, Bill and the gang answer fan-submitted Cosmic Queries about the changing climate. Talking Climate Change with Bill Nye, Chuck Nice, and Kate Marvel. Photo Credit: Ben Ratner. Climate change can sometimes be a hard concept to visualize and Kate does a great job of making it easy. As she points out, it’s hard to understand the impact of climate change because no one experiences the average temperature of the Earth. We all experience the temperatures of our own micro-ecosystems within the Earth. So how can we tell climate change is making the temperature rise? Well, as Kate says, think of it like doping in sports. Climate Change is like we’re doping the weather. We can’t concretely link specific weather events to climate change yet, but we know what climate change does and we know that it has impacted the weather in certain ways. Just like putting performance-enhancing drugs in an athlete, we can’t say the drugs caused the athlete to win, but because we know what the drugs do, we damn well know it helps push them to victory. You’ll also learn how to convince climate deniers of the truth about climate change, if there are advantages to nuclear energy, and what we’re currently working on, if anything, to reduce CO2 emissions already in the atmosphere. Please join us tomorrow night for Our Changing Climate, with Bill Nye at 7pm EDT right here on our website, as well as on our All-Stars channels on Apple Podcasts, Google Play Music, SoundCloud, Stitcher, and TuneIn. And if you’re an All-Access subscriber, you can watch or listen to this episode ad-free at 7pm, too.